This is the first in a very long time that my house hasn’t been pretty much decorated for Christmas a week after Thanksgiving. My husband brought up one of our trees, so we do have a bit of a start. We plugged in the lights, which fortunately are still on the tree from last year, only to discover that half a string did not light. Phooey. Fortunately, after removing the string, the bad light was discovered and we’re back in business. Except I have to re-string them on the tree. Don’t you wish you could just wave your wand and magically the lights would be perfectly placed on the tree? A girl can dream. As I’ve been learning contentment, I’ve discovered that I am so much more about living in the moment than ever before. You might remember I enjoyed summer so much I didn’t want to move into fall. And then, after moving into fall and relishing every bit of beauty and crisp air, I’m now dragging my feet into the Christmas season. It seems like there is a fine line here that I need to step over. Once I find it. Haha. The perfect solution in my world, would be to do a little Christmas cruising and get my creative juices flowing. Would you like to travel along with me and pick up a little bit of inspiration too? Hop in our imaginary carriage as we take our own little Christmas tour. Our first stop is Simple Thoughts. Isn’t this vignette at Paige’s home lovely? I have some vintage aqua glass balls like these. Hmmmm. Paige‘s bowl of vintage Christmas balls has me inspired to do something fun with my little collection. 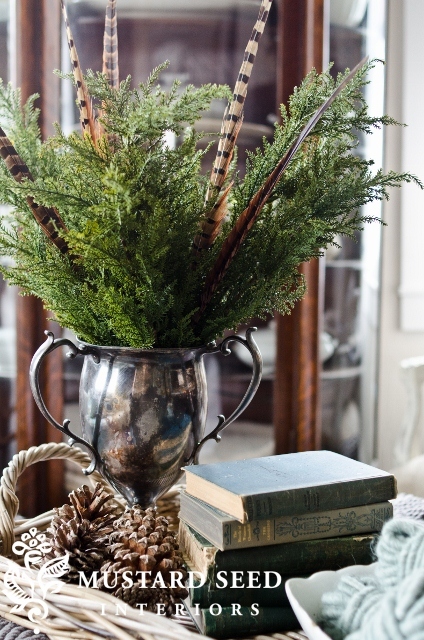 Are you a fan of vintage ornaments too? Do you remember when I shared about my vintage blue glass jars? My stash is rather sizable, so I’m thinking that I need to include them in my Christmas decor with the vintage aqua Christmas balls. It will certainly be something new for me. With my newly painted white trim in the great room and sun room this Connecticut farmhouse dining room is inspiring me to hang some wreaths in my windows. Notice the paperwhites? I’ve already planted some of those. What do you like here? Pinecone trees. What a fun and easy idea. In the fall I played around a little bit with an idea like this. Do have a pinecone collection? Mine goes all the way back to the first house we built. Since our yard was bordered with tall Scotch Pines, it was easy to amass a box of pinecones. We just might have fun with this. Hmmmm. What to use for their little stands? Time to go digging. Miss Mustard Seed is one of my favorite bloggers. So down to earth and such an artist in the way. Marian is very inspiring in the way she paints furniture and makes little vignettes. Isn’t this a sweet winter/Christmas vignette? Do you have a stack of green books? Time for me to raid the bookshelves in the den. Don’t you think that the addition of a “Noel” banner is a wonderful addition to the wreath? 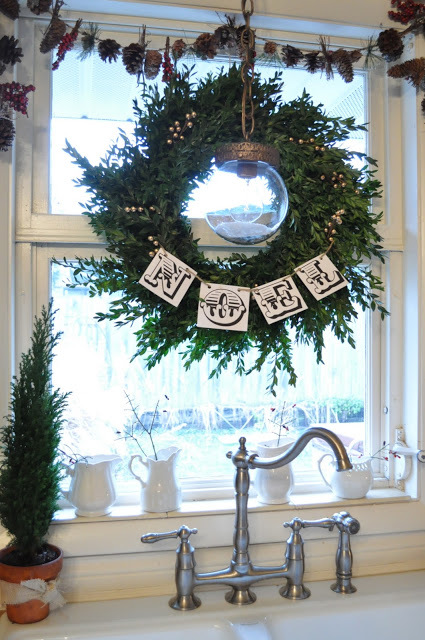 Jennifer Rizzo has her’s in the kitchen and it’s certainly a fresh wreath. I confess to having several artificial wreaths. Hmmmm….where shall I put one with a little paper banner? Are you inspired to make one for your wreath too? Okay….I confess…I’m totally smitten with paper banners. This one from Ella Claireis so festive. Do you like it too? I’m not sure where I would hang one, but the creative wheels are turning. Let’s see now….what are the things for which I need to shop my stash? That’s a pretty good start! Are coming up with a list too? 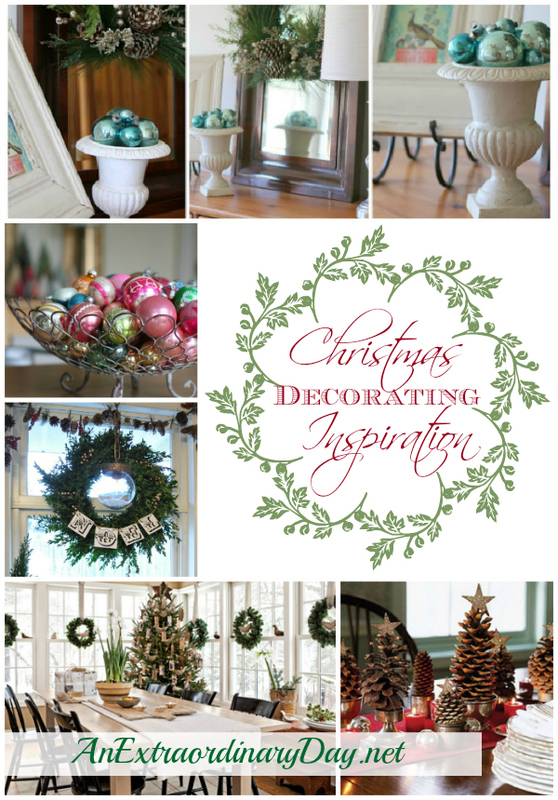 Did our little excursion around the internet help you come up with a decorating plan too? Be sure to leave your thoughts below. I can’t wait to hear what you’re up to. Please stop by Longaberger Lifestyle Bless Friends & Family with Unique Handmade Goodness this Christmas! Check out the fantastic daily SALES, too! Lots of fun creative ideas here! Love to see the different ways people decorate. We are pretty classic with the reds/greens but I like the reds to be more burgundy and the greens to be more “pine-y” in color. I’m not even close to decorating either…hoping to get a real tree sometime soon, a small one to fit our little cottage space. Thanks for the glimpses of Christmas, it does help to stir my imagination…blessings! Yay! Mission accomplished! I like my reds in the cranberry family, too. 😀 Looking forward to seeing a few glimpses of Christmas at your house in the upcoming weeks! Have fun! It sounds like you are off to a lovely start! wow – gorgeous! So much work! YEs, I did create my December Journal – you should try it this year – it is so wonderful to look back on the old books! Wow…it looks fabulous. Thanks for the encouragement…I just might make my own too. May your season of Christmas be extraordinarily blessed. Wow–there are a whole lot of nifty ideas here! I’m excited to see what you do with that newly painted room–how could you not love the wreaths in every window? And that very simple tree in it…looks like cards hung from the tree, which is just a cuter than cute idea. I came home to discover more lights up the other day! *laughing* He’s getting in the mood–I can tell! And now, it’s probably time to take down those lights. We’ll need to have a big melt here first!! May your weekend be Extraordinary, Christine! !